Family Capital: What does your organization, Family Office Association do? Angelo Robles: The Family Office Association is a private global membership organization headquartered in Greenwich in Connecticut, where successful families and their family offices can connect and share within an exclusive global community. Here they’ll be able to turn to peers among the world’s most prosperous families and family offices for the specialized expertise and resources specific to family offices. It is these connections, together with our proprietary research, practical tools and methodologies, and access to top experts and thought leaders, that have made us respected within the community. 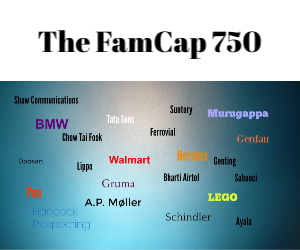 Family Capital: Why did you establish the Family Office Association? Angelo Robles: I felt a tremendous need for best practices, thought leadership, creativity and connectivity, within the family office community. We started small with an intimate group in Greenwich, and over time expanded nationally and then globally. We are a pure membership model, most of our revenue is from hundreds of family office dues paying members with a limited amount from corporate relationships. Family Capital: How long ago did you found Family Office Association? Angelo Robles: It’s been 10 years now. Time flies when you’re having fun! Our national USA reach has mainly occurred over the past seven years and globally we’ve expanded greatly in the last two years. Family Capital: What resources does Family Office Association have for start up single family offices? Angelo Robles: Everything! There are many moving parts in creating an single-family office, I don’t mean to be self promoting, however I do believe my book, Effective Family Office: Best Practices and Beyond is a valued resource to families, especially relative to leadership, culture and people development. As a startup family office some of the issues we discussed in our Q&A, however in building upon that, family commitment, governance, structuring, taxes, leadership, culture, psychology of the family and the family office relationship, and what I refer to as best practices on everything investing, hiring, policies and procedures etc. The family office community is often lonely, you’re in a silo, as a newer family or executive, you need resources and peer connectivity. Family Capital: You have mentioned the importance of talent. This is an important topic for the Family Office Association? Angelo Robles: Very much so. We discussed this earlier in the interview, I’ll try not be repetitive and add new information. This comes down to productivity. We do spend a lot of time on teaching people how to be productive. Being the best you can be and getting the most out of others in the family office. More so in our masterclasses, where we provide the resources to make our families and the family office executives the best they can be. I won’t bore your audience here, however, there are timeless techniques including Richard Koch’s 80/20 principles, the Eisenhower Box and other modern practices that can take SFO executives in particular to another level. Sadly, most SFOs are mediocre, however with the right direction and resources; and if they desire, they can be great! By the way, all of this applies to existing family offices as well, if anything complacency and the “way things are done here” get in the way of moving forward, the future and improving. The vast majority of single family offices won’t make it into the next generation. To me this is a shame. Family Capital: You mentioned masterclasses, explain more. Angelo Robles: We host private programs around the world for members, however we host some very intense multi-day masterclasses for a very limited number of our highest level members. We bring our deepest research and thought leadership on many of the topics we discussed today and include world-class experts often from outside the family office community for perspective. I’ll take a moment and highlight one we’ve been building towards for years, my interest in psychology. I’d like to thank the mentorship of Dr Stephen Rudin and his guidance on the value of his six neurocognitive skills for transformational success in preserving family wealth across generations. Many of the family office subjects discussed today in our Q&A all relate and have their roots in these six skills, understanding, being self aware and improving in them, goes a long way to being successful within a family office and life. I’ll leave you with three of the six! Executive function, emotional intelligence and design thinking. Family Capital: How can people learn more about what you do? I’d also recommend they listen into my podcast on iTunes or Stitcher (for non Apple users) titled: Effective Family Office. I’d like to thank you so much for the opportunity, I enjoyed the interview very much! Angelo Robles is the founder and CEO of the Greenwich, Connecticut, based Family Office Association, an exclusive global membership organization that delivers proprietary thought leadership, research, best practices and global programming to multiple generations of exceptionally wealthy families and the professionals who run their single family offices (SFOs). Angelo is also the founder of Effective Family Office a think tank and Masterclass Program Series for single-family offices and the analytical data-driven firm Family Office Statistics. He’s the author of the book, “Effective Family Office: Best Practices and Beyond,” which ran for several weeks as the number one book in Office Management on Amazon.com. Click here to purchase the book. Angelo is the host of the Effective Family Office Podcast on iTunes. Angelo personally advises a small number of global families and SFO executives on achieving maximum effectiveness. Angelo’s expertise has been sought by media outlets such as Bloomberg Radio and Television, the Wall Street Journal, and Institutional Investor, among others. Angelo continues to lead in the SFO community with creative proprietary thinking on the future of the family office including structures, organization, leadership, technology, AI, investing and philanthropy.